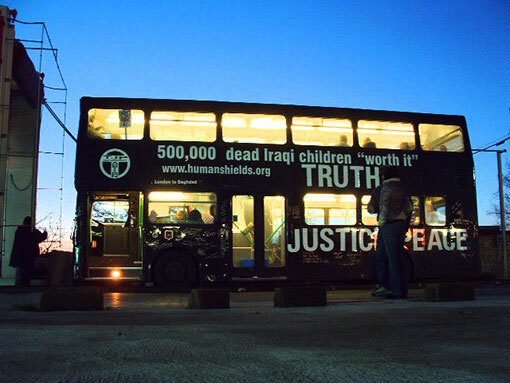 On the 25th of January, 2003, thirty human shield volunteers and three double-decker buses left London for Iraq, picking up other volunteers throughout Europe on their way. At their peak in Iraq they numbered approximately 500. The action’s primary goal, instigated by Ken O’Keefe, was simple; get thousands of (mostly white) Westerners to Iraq to make the bombing and invasion of Iraq politically untenable. In this goal the action obviously did not succeed, not in the least because of time constraints. As it became increasingly clear that the U.S. would invade Iraq a secondary goal was developed; volunteers would place themselves at strategic sites critical to the well-being of Iraqi civilians in order to make the bombing of these sites politically untenable. Two water plants, two power plants, a food silo, a communications facility and an oil refinery were chosen. Along with others the U.S. and UK governments were notified of these positions. It is a war crime to harm infrastructure critical to civilian well-being. This did not stop the U.S. from targeting and bombing these sites in the 1991 Gulf War, causing untold sufferering for millions of Iraqis (of whom just under half were children). Of these sites only one was bombed in 2003; the communications facility, a day after the human shields pulled out of it. It is difficult to know to what extent this action had an effect, but we do know that were it not for the pressure brought to bear on our governments by the unprecedented size of the global peace movement and the implementation of our secondary goal the war criminals in power may well have bombed these sites as they did in 1991. When you are a part of an action like this, and you are able to read the “news” about the action as it unfolds, it can be quite an eye-opener as to how a profit-driven media really works. You get to know very quickly who the good journalists are, who the lazy journalists are and who the outright liars are. What follows are some of the better examples resulting from the fact that the last two groups make up a frighteningly large proportion of journalism. 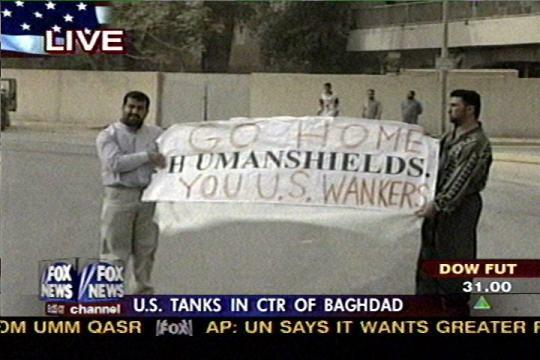 On the 9th of April, 2003, subsequent to the fall of Baghdad, it appears that two Iraqi men held open a large banner outside the Palestine Hotel along the lines of “Human Shields go Home.” In fact the banner was one of our own on which the word “HUMANSHIELDS” had been printed in black. One of our more passionate volunteers used the first thing she could find as a makeshift banner when she had heard that the U.S. military had arrived outside Palestine Hotel and spray-painted “GO HOME YOU U.S. WANKERS” on it in red paint. See the banner for yourself. Of course ‘wanker’ is certainly not a word you would typically hear uttered from the mouth of an Iraqi. The events surrounding this photo have been widely acknowledged as a Pentagon-staged media stunt, so it would be interesting to meet the two men holding this banner and find out who they really are and/or what they really think. They may not even have understood what the banner could mean but noticed that journalists laughed at it, and took pictures, as the journalists believed the expletive referred to the human shields. 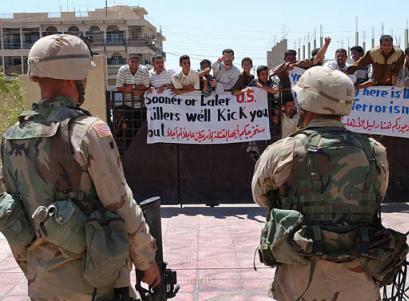 Now here’s another more telling banner, Fallujah, Iraq 1st May 2003. You be the judge. soory - didn't get this previous email.? am in kurdistan now, northern iraq. things are going well but i have very little time for internet.? check out this though, let me know if it helps. i'll try to get you the letter i sent in to my home town paper clearing my name?after they ran the article. Who is “Rev. Ken Joseph Jr.”? This character is said to have been a human shield volunteer who changed his mind once he had arrived in Iraq on the basis that an Iraqi man had told him “we don't want peace, we want the war to come,” a story which gained traction in the corporate media just before the invasion. He appears to be a missionary campaigning for some kind of religiously motivated “Assyrian Independence” and the restoration of the ancient Assyrian Empire. He never registered with the Human Shield Action to Iraq and no one, it seems, ever meet him. His presence in Iraq, in deed if he was there at all, appears to have been motivated by his campaign for “Assyrian Independence” rather than the welfare of the Iraqi people in the face of an invasion.